I just wanted to introduce you to Daisy. She took about three weeks to build. It was my first project and a lot of fun to make. I made a couple of mistakes along the way, but she turned out beautifully, and she has a very balanced tone. The instructions were very well thought out, especially for a novice builder like me. Thanks for such a great kit. This axe will last for generations. The mandolin arrived today and I absolutely love it! The straight grain soundboard is just what I wanted. The unique shape is even more distinctive now that it has a tree rosette. And it sounds great! 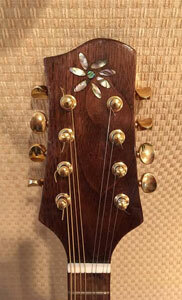 The mandolin kit arrived well and very fast and the parts are in fine condition. I payed exactly the customs duties I estimated. So: Everything is fine :) Thank you so much! Last sunday I started to build the kit. It is great, because I never thought I can do it - but I can:) The work I was most scared of was to add the fret wire - I did it last night and it turned out to be doable. I´ll keep you informed. 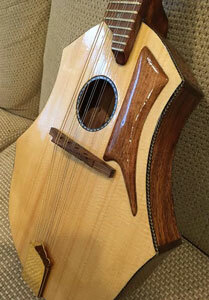 Some time ago a friend approached me asking I build a mandolin he could present to his son-in-law. I agreed but a couple of days later had second thoughts. It would mean much more to the both of them if he made the instrument instead of me. Although my friend had no experience in woodworking, I felt with your kit and my guidance he could. He did and it turned out well. He later stated the experience he had was so gratifying and much more than expected. As we progressed through the process I snapped a few photos. He put these in a slide presentation and showed to his son-in-law before presenting the mandolin to him, a surprise when he read the inscription placed inside the instrument. If interested you can view on the link below which includes the instrument being played by it's new owner. He was very impressed by the sound quality as were some of his professional friends. Said it had a mellow tone of instruments with many years of age. Just wanted to thank you for your product which brought joy to father and son-in-law. 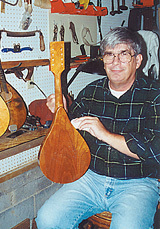 I have reviewed the construction techniques of over a dozen master mandolin makers and none have the simplicity and elegance of the kit that Gary has designed for Musicmaker's Kits.